Major faults within the California Borderland. Image © 2013 MBARI. Base map from Google Maps. Hidden beneath ocean waves and masked by sand and mud on the seafloor, underwater faults are notoriously difficult to see and even more difficult to study. As a result, geologists struggle to evaluate the risks associated with these faults and often can’t include them in seismic hazard assessments. Paull’s team conducted their studies off the coast of Southern California, in a region called the California Borderland, which extends from Baja California to Point Conception. They collected ultra-high-resolution images of the seafloor using one of MBARI’s autonomous underwater vehicles (AUVs). They then used these images to measure the slip rate—the rate at which two pieces of crust slide past each other—within a region of the Borderland called the San Diego Trough Fault Zone. This marks the first slip rate that has ever been recorded for an offshore fault within the California Borderland. The team reported their findings in the December 2012 Bulletin of the Seismological Society of America. The San Diego Trough Fault Zone runs roughly from the Mexican border northward toward Catalina Island. To calculate the fault’s slip rate, the researchers first used data from MBARI’s seafloor-mapping AUV to measure how far the fault had shifted the seafloor. They looked, particularly, at the walls of an ancient and inactive underwater channel, and found a shift of about 18 meters. A portion of the San Diego Trough Fault Zone that bisects an ancient seafloor channel called the San Gabriel Channel. The inset shows a close-up of the channel wall that has been offset by the fault, with white arrows indicating the direction of slip between the two plates. Image © 2013 MBARI. To estimate how long this 18-meter shift took to form, the team used high-resolution sub-bottom profiles from MBARI’s AUV to look beneath the seafloor and measure the thickness of the muddy layers of sediment. They also collected samples of this sediment using MBARI’s remotely operated vehicle (ROV) Doc Ricketts. Based on populations of tiny animals at different depths in the sediment samples, the researchers estimated that the sediment had been accumulating for about 12,000 years since the channel had stopped eroding. Assuming that erosion in the channel would have been powerful enough to erase remnants of shifting, the team concluded that the 18-meter offset occurred within the 12,000 years after the channel had stopped eroding. By dividing the total offset distance (18 meters) by the age of the offset (12,000 years), the researchers calculated an average slip rate of roughly 1.5 millimeters per year. Although this is a relatively small portion of the total eight millimeters of slip per year estimated for all offshore faults in the California Borderland, it is still enough to generate small to moderate earthquakes. In fact, based on their study, the team concluded that the San Diego Trough Fault Zone may have spawned the 1986 Oceanside earthquake—a magnitude 5.4 quake that caused nearly one million dollars in damage, 29 injuries, and one death. 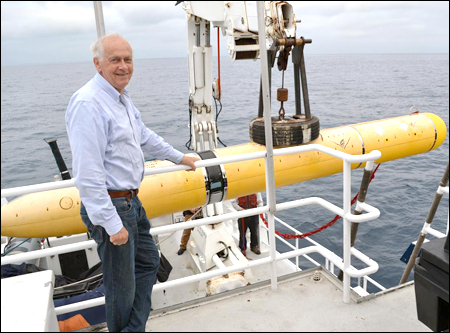 “The coupled use of MBARI’s assets—the mapping AUV which can show us exactly where the faults are and the ROV that allows us to go down there and sample in a really surgical way—allows us to start doing the type of basic land-surface science…that goes into a seismic hazard assessment,” said Paull. Paull emphasized that the team’s methods were very similar to those used to study faults on land, but that this was among the first studies to take the same types of measurements underwater. Using their new sonar data, the team also discovered that this fault extends 60 kilometers (37 miles) further north than previously mapped. It may even be linked to the San Pedro Basin Fault Zone, which extends an additional 90 kilometers to the northwest. If this is the case, this fault zone would be one of the longest in the California Borderland, and could produce some of the largest earthquakes in the region. “It would be one of the biggest [faults] of Southern California, probably second to the San Andreas,” said Paull. Given the abundance of underwater faults in the California Borderland, and their proximity to the San Onofre Nuclear Generating Station, Paull believes these research methods will be used more frequently in the region in the coming years. “I think we are going to see a lot more of this done in the future,” he said. Ryan, H.F., J.E. Conrad, C.K. Paull, M. McGann (2012). Slip Rate on the San Diego Trough Fault Zone, Inner California Borderland, and the 1986 Oceanside Earthquake Swarm Revisited. Bulletin of the Seismological Society of America 102:2300-2312. Jul 10, 2014 – Using maps produced by the AUV, MBARI researchers on the Western Flyer have identified hundreds of hard surfaces on the seafloor south of Santa Cruz Island. 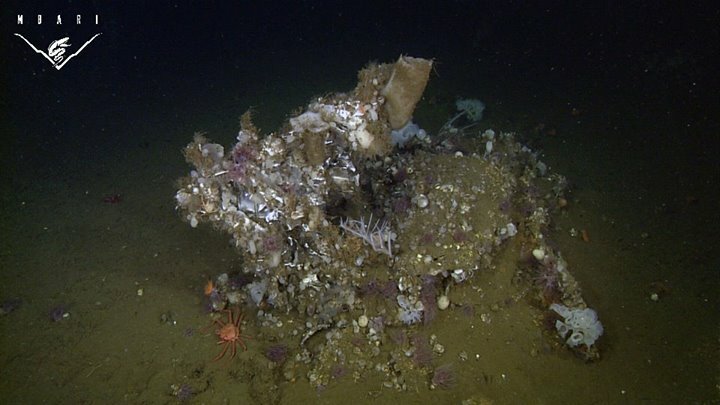 With the ROV Doc Ricketts, researchers can visually confirm and identify these objects, many of them man-made. Jul 9, 2014 – On Monday, a group of MBARI scientists led by Peter Brewer headed south along the California coast on the Western Flyer. They are revisiting an area south of Santa Cruz Island that was previously used as a disposal site for both civilian and military debris. 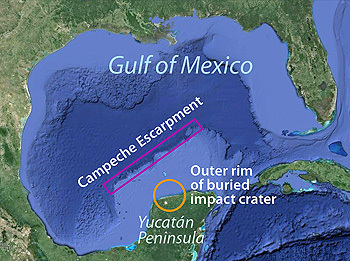 Dec 9, 2013 – About 65 million years ago, an asteroid or comet crashed into a shallow sea near what is now the Yucatán Peninsula of Mexico. The resulting firestorm and global dust cloud caused the extinction of many land plants and large animals, including most of the dinosaurs.